Back in September, in preparation for the release of his Nothing Was the Same LP, Drake launched three pop-up shops on the same day. Now, the artist has announced another batch of pop-ups. 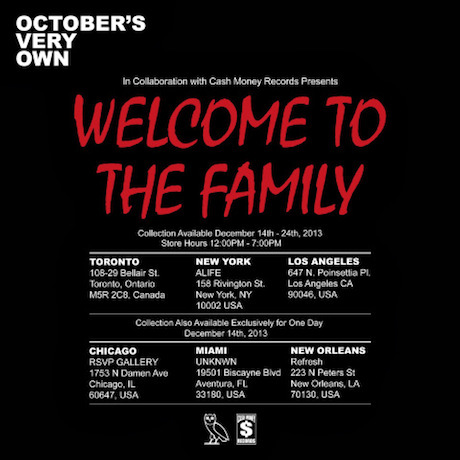 On December 14, Drake will unveil six new pop-up shops under the banner "Welcome to the Family." The stores will offer a new collection, with hours running from 12 p.m. to 7 p.m. It's unclear exactly what the collection will contain, though the poster above says it will be available from December 14 to 24 in select cities (in others it will only be available for one day). There's only one Canadian shop, located in Toronto at 108-29 Bellair Street. The other five have locations in New York, Los Angeles, Chicago, Miami and New Orleans.